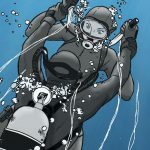 Remember the “citadel below” scuba comic? Well, for a very long time no new pages, but now it continues! Thanks a lot to the talented guys behind it!